Virtual & Augmented Reality have been seen by many as the next big technology revolution, set to disrupt the way in which we interact with data, IT & even the real world. The success of PlayStationVR and Pokémon Go has demonstrated the public’s willingness to embrace these technologies for gaming, but there may also be the potential for this technology to also transform our experiences in a broad range of other domains. 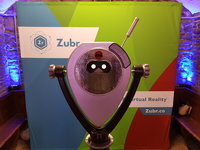 Local business Zubr have recently developed a VR viewing device (shown in image above) which allows users to virtually travel back, and forwards, in time to view the heritage and development of a particular location. The City hosted the World VR Congress in 2017, and has recently seen the launch of the Bristol VR Lab. Bristol is positioning itself as a centre of excellence in this emerging technology.